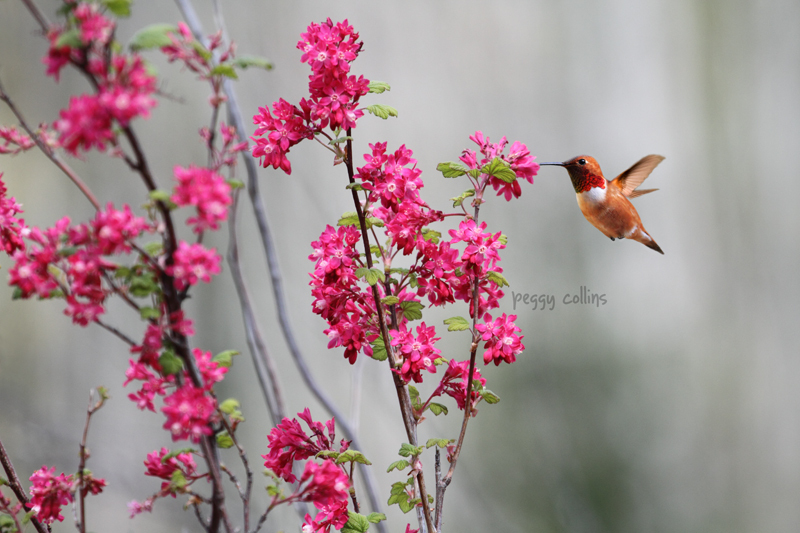 Peggy Collins Photography: The Hummingbirds Are Back! We have two kinds of hummingbirds here on the Sunshine Coast of British Columbia. The Anna's hummingbird stays for the winter but the rufous hummer winters in Mexico and returns mid-March to April. I rarely see the Anna's but we've had some busy little rufous hummingbirds buzzing around here for weeks now. Rufous hummingbirds seem to be particularly territorial and will often do their best to keep other hummers from using "their" feeder. You can hear the angry buzz of the male rufous's wings (but interestingly, you don't really hear the female's wings), and if he's particularly upset with you he'll tell you off with a "chee chee chee chee" sound. The males are also experts at dive-bombing when they're really ticked off...they fly very high then hurtle downwards, of course topping it off with a "chee chee chee chee!" The wild red-flowering currant bushes bloom in April and the hummingbirds really love the nectar, so I've been practising getting some shots of the birds around the pink flowers. If you click on either of the pictures or links above you'll be taken to my Zazzle shop, Fun Nature Photography, where you can customize that particular photograph and have it printed on dozens of different products. 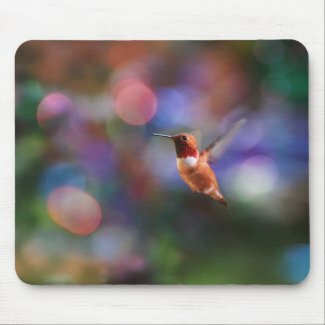 But I thought I'd show you another hummingbird photo that I took where it's already printed on a product, in this case, a mousepad. 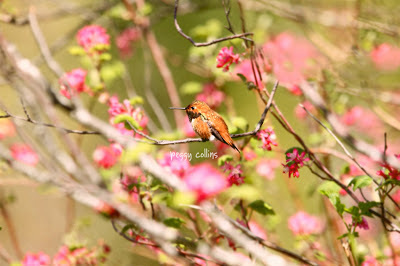 This colorful hummingbird photo is also available on many other products in my online shop. I've been looking around for a rufous hummingbird nest but haven't had any luck so far. They're very small and hard to spot but I keep trying!